I started on the model by taking some pictures of the parts that came with the kit. The sprues were then washed in a soapy solution and brushed with an old tooth brush to remove any oils, rinsed the sprues and let them air dry. The instruction called for a ½ oz of weight to keep it from being a tail dragger. Some flattened lead fishing weight was added to either side of the fuselage. Also the front nose gear compartment had to be added to one side of the fuselage, before assembling the fuselage halves, the down side of this step is that the front strut had to be inserted in the nose gear compartment, it couldn’t be added after the fact. 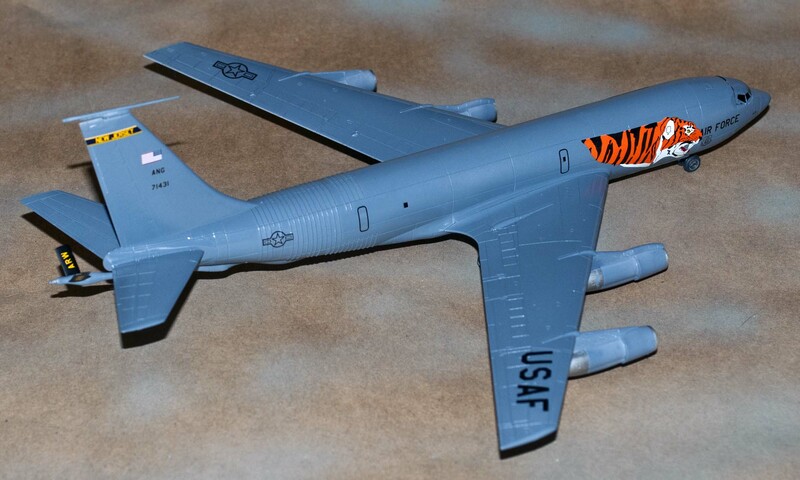 This called for extreme care to be taken during the entire assembly process, so that I didn’t break it off… It is not unusual for a KC-135 front nose gear doors to be in the up (or closed) position while on the ramp. The fuselage halves were attached to the sprues with very thick stubs. They should have been on the inside of the fuselage halves. It took quite a bit of work to get them sanded out without affecting the parts. On a side note, while at the I Hobby show I talked to a Minicraft rep about that issue and he replied that they had gotten a lot of feedback on the same issue. 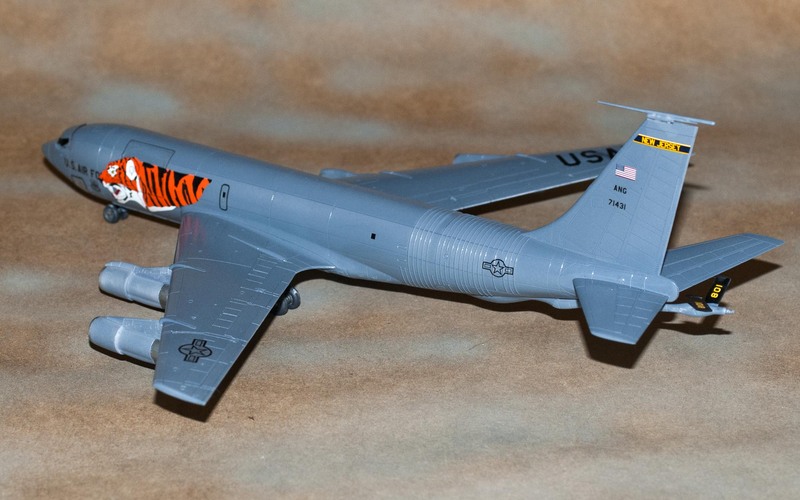 He indicated this was the first model produced by their manufacturer over in CHINA and would be looking to improve this issue on the other KC-135 Variants due to come out late 2014 or early 2015. I started with the fuselage, by adding some weights (flattened fishing sinkers) to the inside of each half of the fuselage. After gluing the halves together, I put the fuselage aside to dry. The wings were the next parts to be assembled. They went together well. I spent a couple of hours cleaning up the seams on the fuselage. There was one dimple near the seam that I filled with super glue and sanded smooth… I did some dry fitting of the wings to the fuselage and the fit was very good so there was very little filling and sanding to do. The next thing was to put together the engine assemblies. The engine halves had very thick sprue attachments, which took a lot of work to remove them. I sprayed the interior of engines gloss white. The compressor intake fans were painted aluminum and the exhaust fans were painted titanium. These were then inserted and glued into the engine halves before cementing them together. The wheels and hubs were painted the appropriate dark grey for the tires and aluminum for the hubs. The landing gear struts were given a couple of coats of gloss white. The struts were then dry fitted to the underside of the wings to make sure they were a good fit. Once this was accomplished, the wheels were attached to the struts in order to get them to sit correctly when they were on the ground. The engines assemblies were then painted. I first painted intake rings and exhausts the appropriate metalize colors. 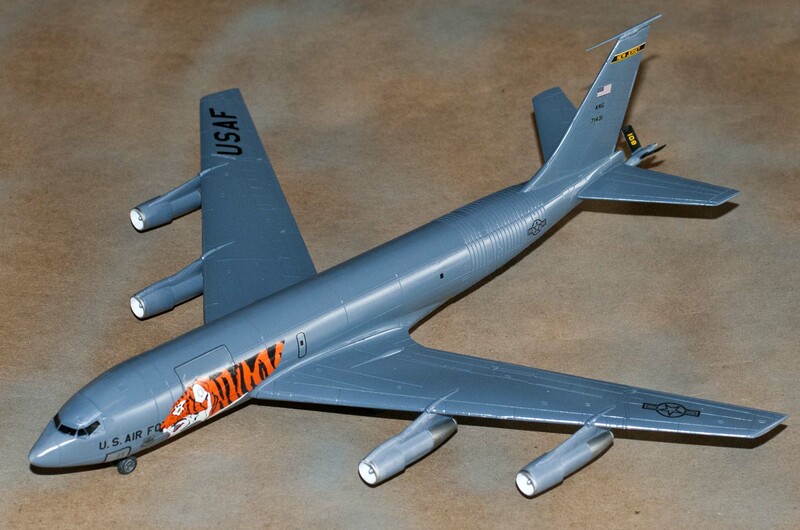 The paints used were Aluminum (MM 1781) for the rings and Jet Exhaust (MM1796) for tail end of the engines. This was done because these paints have less of a tendency of being lifted once the tape is removed. 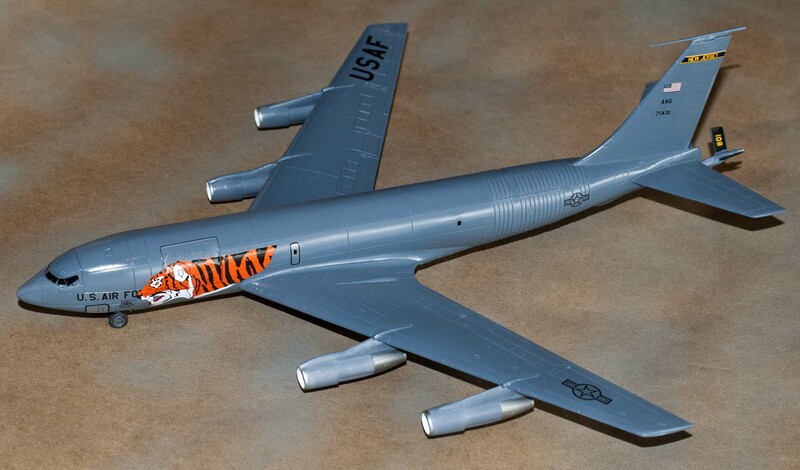 The engine assemblies were then painted Model Master Acryl Air Mobility Command Gray 4754. I then painted the fuselage and wings separately before putting them together. I set them aside to dry for a day. I then attached the wings to the fuselage. After letting this dry for another day, I worked on attaching the engine assemblies to the wings. I then gave the model of some mist coats of Future. Once I thought I had enough of a gloss finish, I then worked on putting the decals on the plane. Even the big decal of the Tiger went on well. 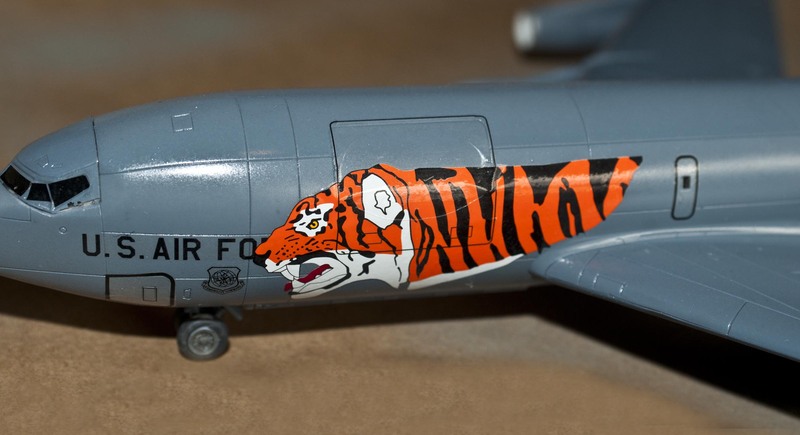 I had to remember to put on the U.S. AIR FORCE decal first because the Tiger decal would cover some of the lettering. I opted to use the decals for the cockpit windows, since there was no detail inside the plane to see. It also helped by being able to paint the entire window assembly while attached to the fuselage, rather than trying to mask off the frames. 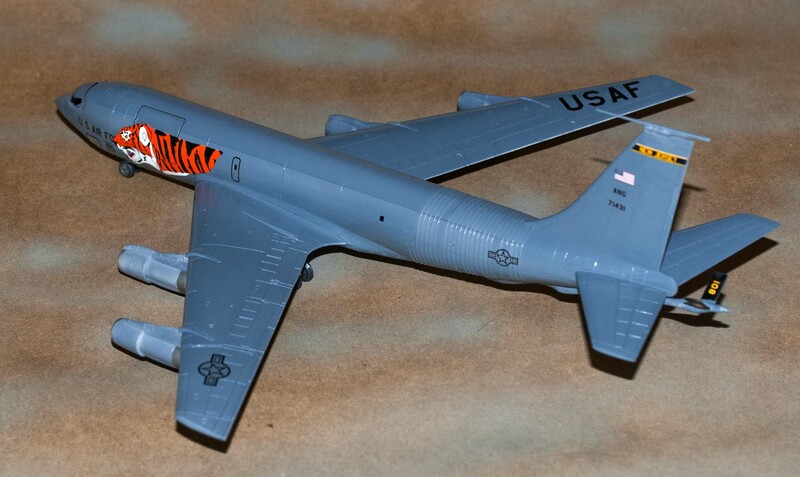 This was the 2rd variant of a KC-135 that I built from Minicraft. The first one was the E-3 Sentry AWACS, with Rotodome radar dish. I’m now working on The E-8 Joint Star variant of the 135. 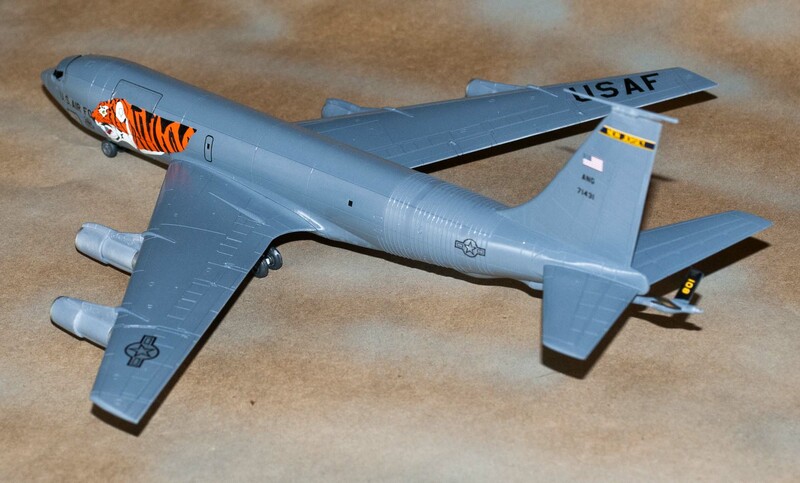 Minicraft has in new tooling a KC-135A, EC-135C, KC-135R (Re-engined version). Also in the future are these variants, E-6 Mercury USN and an E-6/E-8 AWACS/Joint Star. 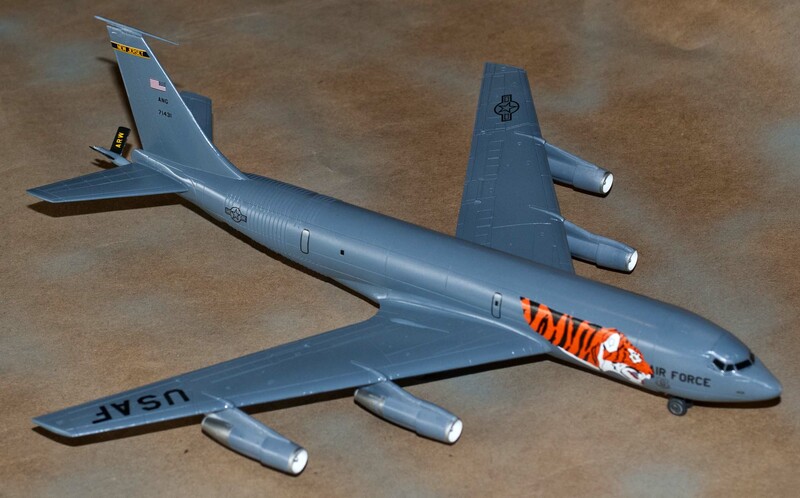 It will make a nice display of all the different variants of the Boeing KC-135.